When you are a Fitdigits Star Member you get to create your own group and group page! Have fun with your friends and family, share activities, create leaderboards, and more. 1. Upgrade to a Star Membership with Fitdigits. You can edit your group information any time from the Member Admin page. Simply click on the name of the group to see current group info, change the group password, etc. See below on Managing Users for more. Users can be invited, added, deleted, and assigned roles from the same group admin page. 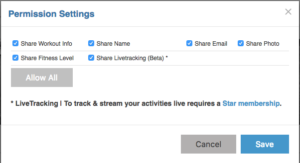 You can assign the role of user or admin. There can only be one owner for a group. The group owner can’t be deleted until the role has been assigned to another member in the group. Each Group is structured to have one group Owner and one (or more) administrators (admin). The group is good for up to 10 total members. The Owner of the group has permission to add and delete users as well as assign group roles, while Admins have the same permission, except they cannot make anyone an Owner as there is only one Owner per group. Each member has the ability to specify what they want to share with a group. This will affect the view of things like group feed, roster, leaderboard stats and more. Members can view or change their settings at any time from the group view, tapping the menu icon and My Group Sharing Permissions in the main menu. Once a group has been created, it gets a group page dedicated to it for the members to visit. As the owner or administrator of the group, you can customize the page and what is viewed in a variety of ways. See the next section on managing the group page. Thank you for your interest in Fitdigits health, fitness, activity tracking and heart rate training apps, iCardio, iRunner, iWalker and iBiker. We hope the following short video will help you get up and running (pardon the pun) in no time! Each of our apps offers a distinct experience, but they all share a similar Fitdigits account and general functionality, based around activity and heart rate tracking and training, creating a fun and engaging tool that can help you stay healthy and hit your goals. We hope you enjoy the video above and it helps you get started, as getting started is the most important part! 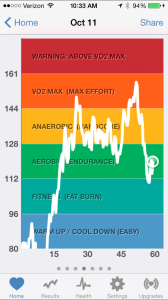 After the basics, you might want to take a deeper dive into the app settings, where you can set options by Activity Type, including Audio and Voice Feedback, Laps, Dashboards, your Chart and Map Metrics, Heart Rate Zones and Pace Zones. You can also learn more about overall App Settings like Zone Alerts and Prompts, customizing your home screen, customizing heart rate zones, or Auto Pause, or managing Heart Rate Monitors (HRM) and other sensors. You can also learn more about managing your activities and history by editing workouts, deleting workouts, change a workout type after a workout was recorded, entering a manual workout, or customizing your own Other workout type. Fitdigits now offers a new activity feed for your recent activities, which allows for quick and convenient access to stats, all from the home screen. View and compare your workouts from bird’s eye view so you can keep track of your fitness and health progress. 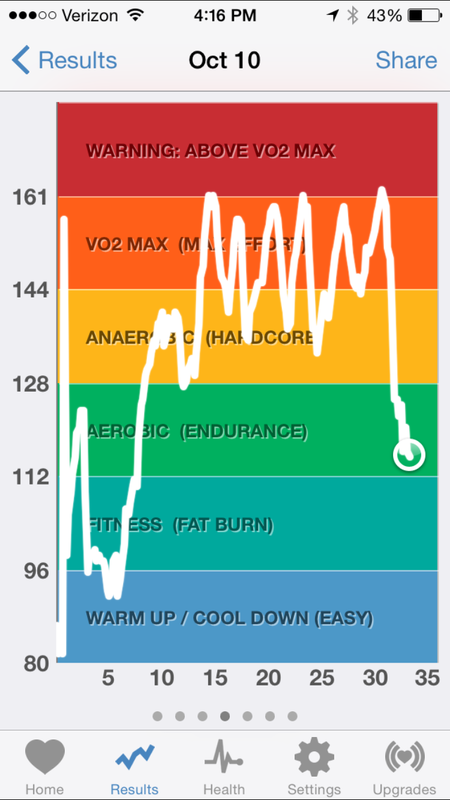 When tracking with heart rate, compare heart rate charts at a glance. Look for helpful tips and articles in the feed. Access the activity feed by swiping up from the bottom of the home screen! To expand workout details and view the full summary of your workout, simply tap the workout from the activity feed. To sync any unsaved workouts containing a yellow heart, tap (from the upper left corner) menu -> sync. To delete any workouts from the app, go to menu -> results. Tap edit and then delete the workout in question. To minimize the expanded feed, tap or swipe the the top arrow down. To refresh the feed – typically only if you don’t see a recent activity showing up, swipe up the feed to full screen, then slide down and hold for a second the feed. The top should catch and say “Refreshing Feed” for a bit. That will rebuild your feed based on the activities showing in the app under Menu > Activities. If you are experiencing any problems, please contact Support. The newest release of Fitdigits apps for both Android and iOS feature a totally revamped home screen and activity picker carousel, allowing users to choose from over 50 different workout types, or customize that even farther with Other workout types. 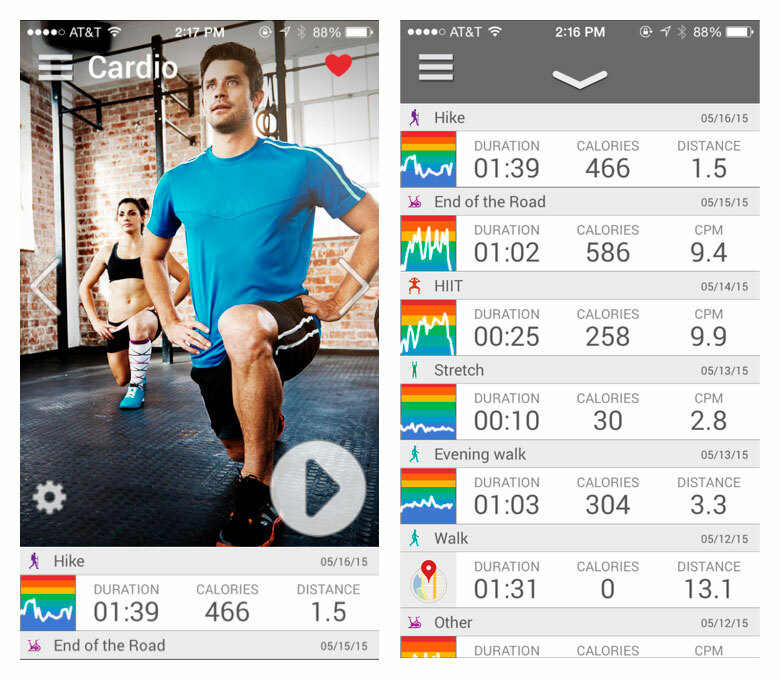 With it comes the ability to customize your home screen, allowing users to choose which workout types they use most. Launch your most frequently used workouts faster. From the home screen, swipe left <-> right until you come to the “Try Something New” screen. Select your activity type. Done. New workout types can be added or removed at any time. These will appear in alphabetical order on the home screen. Tap the settings (gear) icon in the lower left, across from the quick start button, to choose indoor or outdoor workouts, fitness assessments for that activity type, manual entry of a workout, activity settings and more. For easy access, we suggest storing only the most frequently used workout types. 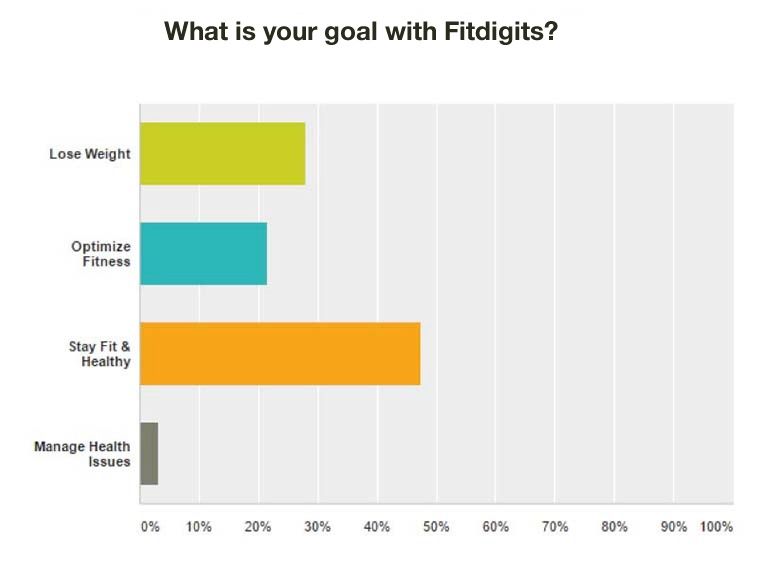 In the February Newsletter we sent out a survey to our dedicated Fitdigits users. In it we asked you to help us by telling us about your attitudes and habits around fitness. A month later, the results are in, and we wanted to share what we learned from you all! 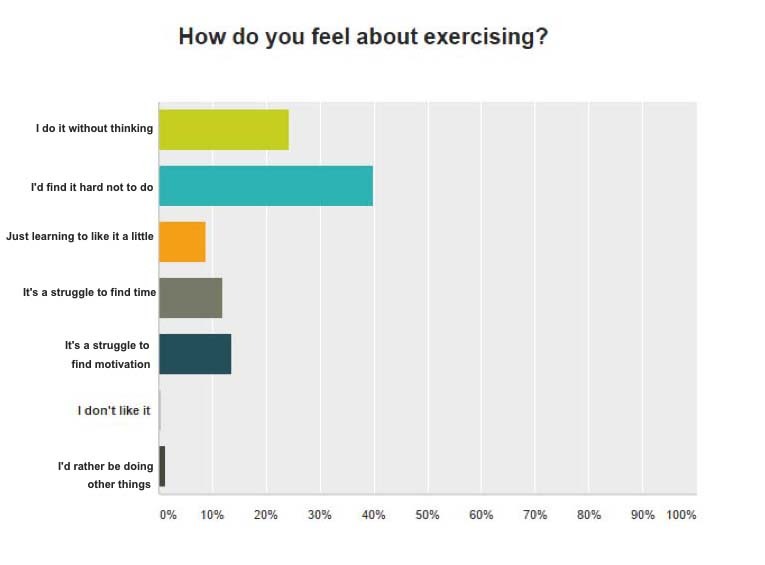 The majority of respondents to the survey are looking to get fit and stay healthy. For more information on training with Fitdigits, we have an entire page dedicated to users who’s goal is to Stay Healthy & Fit. A surprisingly large amount of respondents had no issues finding the motivation to workout. The most difficult part of working out is making it a habit. Once exercise is ingrained into your daily schedule, it becomes as routine as brushing your teeth or taking a shower. Only around 25% reported struggles finding the motivation to exercise. Over 50% of respondents reported using a Heart Rate Monitor regularly. However, not all of those respondents were fully aware of all of the benefits of tracking heart rate. 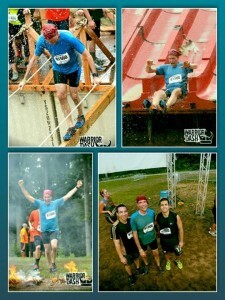 Fitdigits outlines the 4 steps to maximize the impact of Fitdigits and your HRM- Assess, Enable, Sweat and Succeed! 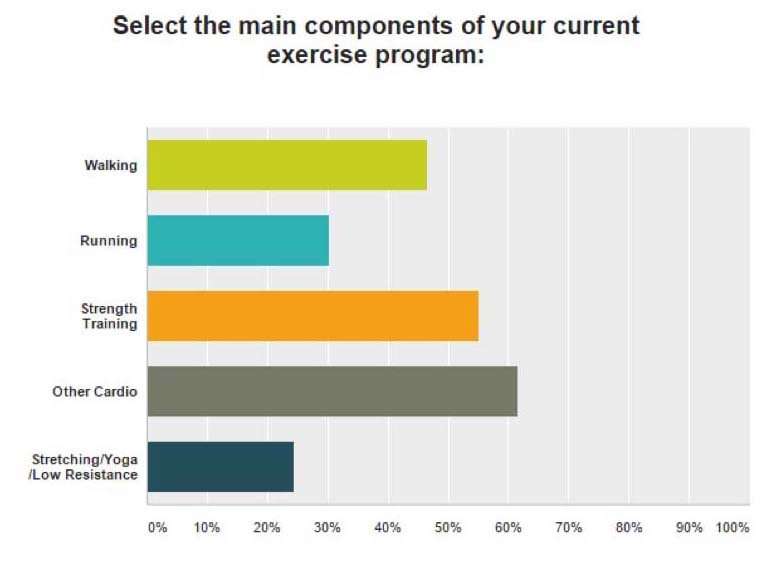 Over 50% of respondents said that there current workout program contains some Walking. Walking is a great low-impact way to burn some extra calories. We suggest recording walks and steps in general with an activity tracker like Fitbit, and aiming for 10,000 steps a day. Read 10 Tips to Walk 10,000 Steps Every Day. The biggest difference between what type of workout would be part of an ideal workout routine and what respondents actually do is in Strength Training and Flexibility/Low Resistance Training. 25% did some Flexibility/Low Resistance work, but 45% thought they should. 55% did some strength training, but 75% thought they should. The majority of respondents to the survey are looking to get fit and stay healthy, though a quarter of you are on the oft-elusive path to losing weight, and a fifth are looking to push the personal envelope! Here at Fitdigits, we often go back and forth between categories as well, though the majority of us, the majority of the time, are just looking to stay healthy and be fit, and to do it in the best heart-healthy way we know. We do understand the different goals, and we value you including us in your journey! For more information on training with Fitdigits, we have pages dedicated to your goals. Around 65% of respondents have a deep ingrained habit when it comes to fitness, with 40% finding exercise “hard not to do” and 25% who “do it without thinking”. Around 25% have difficulty finding the time or motivation to exercise. The best way to stay motivated is to have an attainable goal. A great goal is to work out 2-3 times a week, 30 minutes per sessions. If you need help finding motivation, set a Duration Goal with Fitdigits MVP. 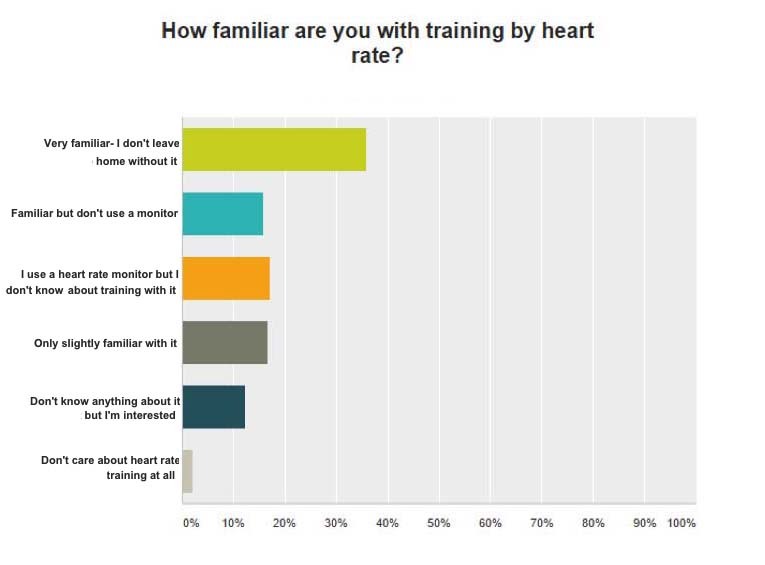 Over 40% of respondents reported not being familiar with training with heart rate monitor. 35% reported being “very familiar” and don’t leave home without it. 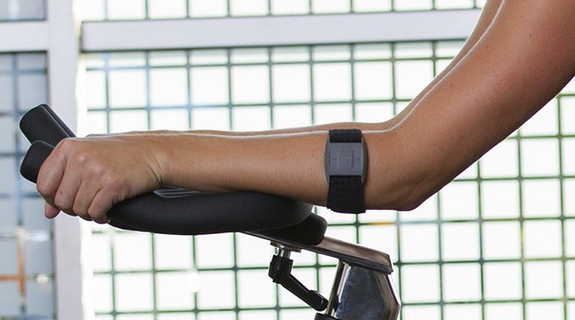 We don’t workout without a heart rate monitor, period! In order to fully unleash the power of Fitdigits, it is essential to have a heart rate monitor. With a heart rate monitor, you can get a more accurate calorie count, custom heart rate zones and complete a Fitdigits Fitness Assessment. 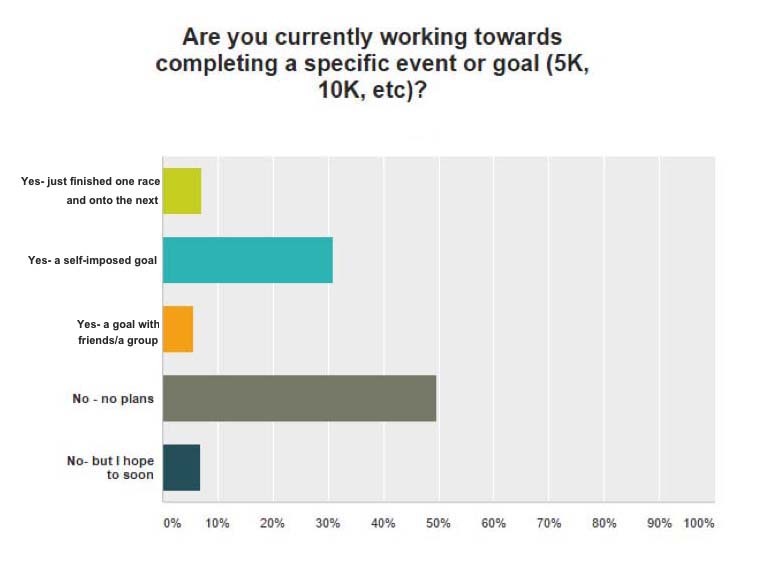 Over 40% of respondents have a goal or event they are working towards, be that goal self-imposed, a goal with their workout community, or a race. However, around 50% have no goal or event they are working towards, with no plans to. While working towards an event like a 5k or 10k is great motivation to give you the push you need to get your workouts in gear, everyone is different and find motivation in different ways. This goes hand-in-hand with most respondents saying they workout to get fit and stay healthy. If you are training for an event, train using duration instead of distance for best results. Over 60% of respondents stated that they do some other form of Cardio for workouts, with 55% doing some strength training and 45% doing some walking. If you are doing an other cardio workout, we suggest using the Other Workout Type in the Fitdigits app. Everyone wants to get buff! 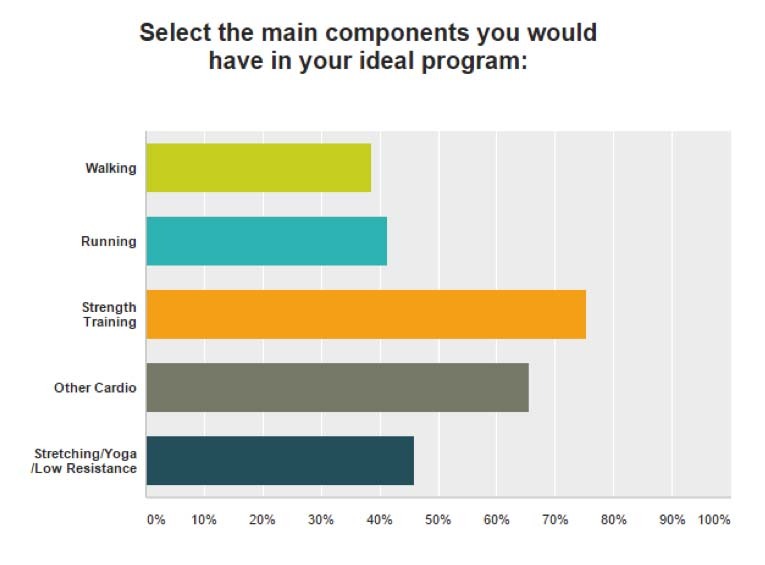 Almost 3/4 of respondents would incorporate strength training into their ideal workout program. 45% wanted to add Yoga/Light Resistance/Stretching into their workouts. We strongly suggest adding weight lifting to your workout regimen. Forget the old myth about strength training getting you bulky- lifting weights is not only a great way to get fit, it can also increase your metabolism. Fitdigits and Fitbit have a great partnership that lets you see how many calories you burn daily. Recently, we have had a lot of questions regarding our Fitbit and Fitdigits integration, so I figured I could take some time to answer some FAQ. 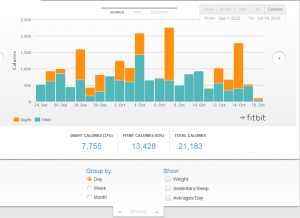 Q: Can I wear my Fitbit during a Fitdigits workout and not get double calories? A: Yes! Fitdigits and Fitbit are integrated so that whenever you begin a Fitdigits workout all Fitbit calories accumulated during the duration of your Fitdigits workout will be ignored. During workouts, Fitdigits gives you a more accurate caloric burn, so we use this instead of Fitbit. Make sure to keep your Fitbit on so you still get credit for your steps! 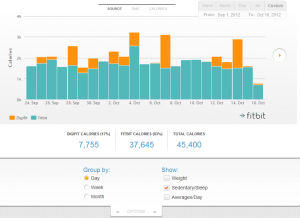 Q: I see my Fitbit calories on my.fitdigits.com, but why are the calorie totals several hundred calories lower then what Fitbit shows? A: On my.fitdigits, we only display the calories burned when you are active, and not when you are sedentary or asleep. If you would like to see these calories included on my.fitdigits, click the “Options” arrow under the chart and make sure “Sedentary/Sleep” has a check next to it. Q: Do my Fitdigits workouts get sent to Fitbit.com? Take a journey with me, to a time before cell phones made for an able guide in even the harshest wilderness. 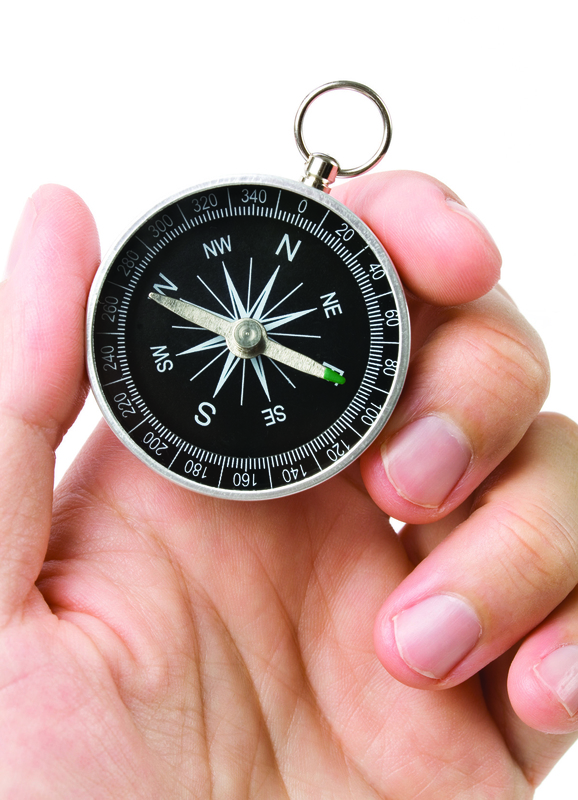 For an explorer braving uncharted territory, one of their most prized possessions was a compass. A compass that rang true acted as a guiding light in even the darkest of times, a good reading leading them to their destination unscathed. Therefore, before they embarked on an expedition, it was of the utmost importance to travel with a credible and consistent compass. Fast forward to the present, and to your own personal health and fitness journey. 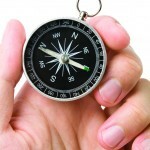 No matter where this long and winding road leads, it is undeniable you will need a reliable compass. When it comes to working out, your compass is a heart rate monitor. A heart rate monitor (combined with the Fitdigits app) will inform and instruct your workouts, allowing you to learn how your body responds and rejects certain workout types. You need a heart rate monitor that is comfortable, reliable, durable and distinctive. You need the Scosche Rhythm Plus. 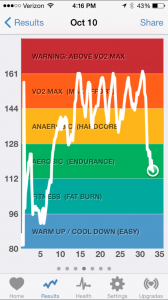 At this point, we here at Fitdigits consider ourselves heart rate monitor experts. Fitdigits was the first app to track Heart Rate, and we were using watches and monitors before that. We have tried more heart rate monitors then we can count, and after countless hours and workouts with a monitor grooving to our own personal beat, we came to the conclusion that the Scosche Rhythm Plus is one of the best in the business. What makes the Scosche Rhythm Plus stand out? Glad you asked. The Rhythm Plus goes right on your forearm. No Replacing Batteries– The Scosche Rhythm Plus is re-chargeable, meaning you never have to worry about going to the store and figuring out which tiny battery belongs in your monitor. Just charge it after each workout and you never have to worry about it dying right in the middle of a killer sweat session. Bluetooth Low Energy– The Scosche Rhythm Plus uses state-of-the-art technology in Bluetooth Low Energy. This allows you to be over 100 feet away from your phone, allowing you to have a worry-free workout without a bulky cell phone on your person. Sleek, Modern Design– While not necessarily quantifiable, the Rhythm Plus just looks cool! It brings to mind a fancy gadget from Sci-Fi or James Bond. No, Q did not cook this bad boy up in his lab at MI6, but it certainly feels that way, using integrated dual LED/optical sensors to produce real time pulse monitoring. Lightweight and Travel Friendly– The Rhythm Plus can fold up to about the size of a Ping Pong ball, allowing you to just plop it into your pocket. Let the Scosche Rhythm Plus be your guide to a better you! At only $79.95, it is the ideal companion to the advanced heart rate functionality that the Fitdigits app offers. The most common resolutions are to lose weight and get in shape. Such goals are vague and undefined and leave you with little direction. When defining your resolutions, be as specific as possible so you know exactly where you want to end up. For instance, instead of planning to “exercise more,” set a precise target like training for an upcoming 5K. While goals should be clear cut, you also need to be realistic. Unreasonable resolutions will lead to frustration and failure. Just like driving without a road map, attempting to reach a fitness goal without a plan will lead you in the wrong direction. That’s why it’s important to devise a plan with a series of concrete steps needed to change your behavior and reach your goal. Such steps may include joining a gym, signing up for personal training sessions, skipping Friday night happy hour, or waking up an hour earlier to run before work. Then write out the individual steps so you can cross each one off as you complete it and feel accomplished. If your goal is not measurable, you can’t track your degree of success, and visualizing your progress is essential for staying motivated. When devising your resolution plan, include specific numbers like a target running pace or fat loss percentage. Then review your progress and note achievements along the way. Tools like Fitdigits’s iCardio app monitor important health metrics like heart rate, pace, distance, calories and more to help you realize the improvements in your health and fitness, while boosting the confidence needed to stick to your resolution. Creating new habits takes time and dedication, and many people expect it to happen overnight. Though enthusiasm for reaching your goal is essential, changing your entire routine overnight will inevitably make you feel burned out. While limiting the number of drinks you consume on a night out with friends is important, completely disconnecting from your social circle and hitting the gym for three hours every day will make you feel alienated. Since it’s a lot easier to commit to a small-level change than a complete life overhaul, commit to a small change until it becomes a new habit, and move on from there so you don’t burn out. Testimonial by Fitdigits User Greg R.
I have been using Fitdigits for quite some time, and my iPhone has a record of 369 workouts. I use it to sync with both a MIO Alpha wrist heart rate monitor and a Polar H7 chest strap HRM. The primary use is to log P90X type workouts and I have been through the original P90X, five times; P90X3 once and am currently in the second phase of P90X2 for the second time. I also use it to log workouts at the gym on a treadmill or an elliptical. What else can I say but thanks Fitdigits! I¹ll be 60 years old in February. 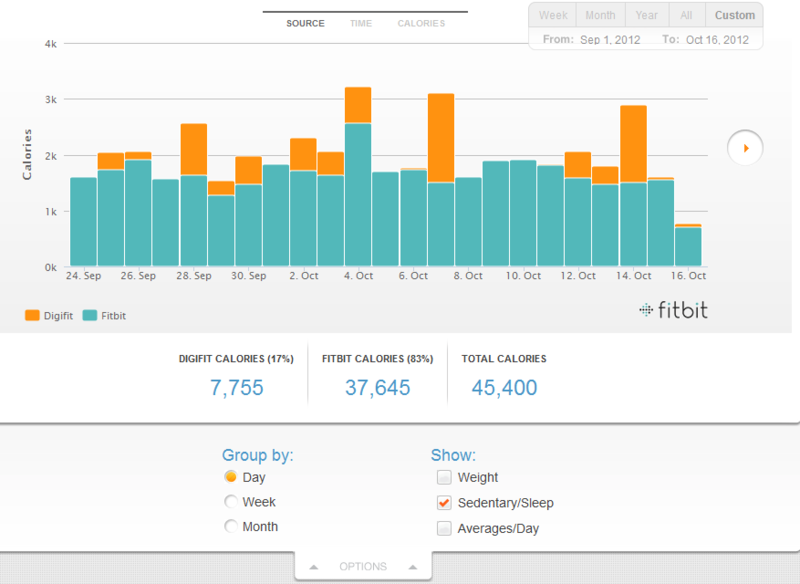 Fitdigits is helping me to maintain my fitness and health, which are two very important aspects of life. 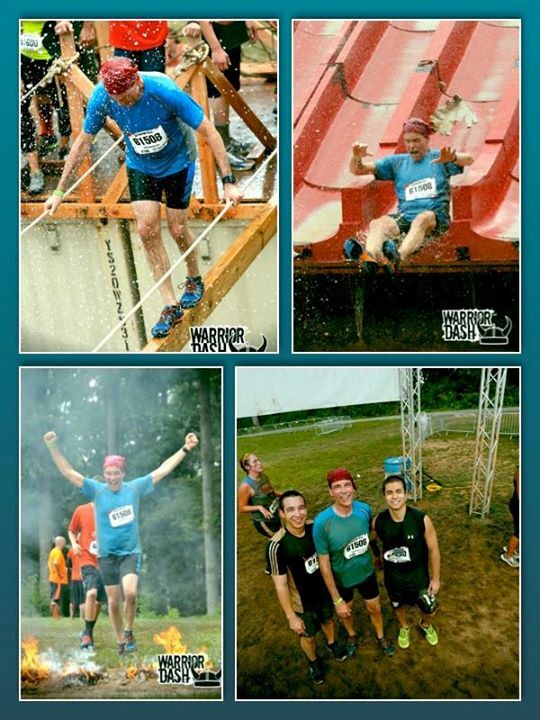 I was able to run in a Warrior Dash in August with my two sons no doubt because of my commitment to fitness and Fitdigits has been a big help in keeping me on track. Check out My Fitness Blog and My Website, where I write a weekly column about monitoring fitness and other parameters of life on my iPhone. The Health app provides daily steps, active & total calories per day and other metrics that help you gauge your activity levels. Fitdigits apps also post to Health with information about your tracked activities within our apps iCardio, iRunner, iWalker and iBiker. Choose what data you want to send to and from the Health app and Fitdigits (see screenshot). The best thing to chose “Turn All Categories On”. All Time – this will sync all days with data on the device. If you previously had data on a date that also has data from this device, it will overwrite the conflicting Apple Health days data from the previous device. If there is no data from the new device, old device data will be maintained (so for most people upgrading, you have a continuous Apple Health data stream). When the sync is complete, you will be asked if you want motivating messaging through the day, just a daily report of the previous days activity, or no Notifications at all. 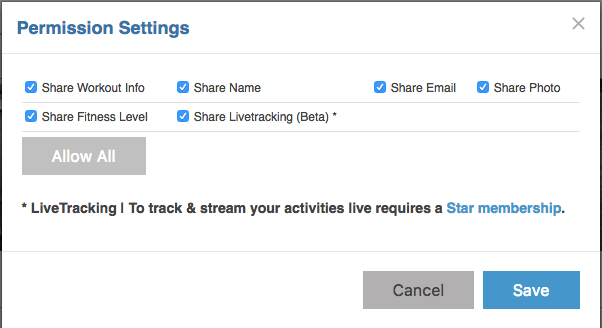 You can always change this setting by visiting the Partners page. To view your daily activity, tap Menu > Daily Activity within your Fitdigits app. Please note: Apple’s Health app is an iOS app that comes standard on the iPhone and iPod Touch. It is a device specific app, it does not share data across devices. You can only be paired with one device and Apple Health at a time, and Apple Health is only supported on iOS 10 and above. See Sharing Workouts for more. If you see a difference in Active Calories posted to the Apple Activity app and what is shared to Apple Health, this article on the subject is quite helpful (here). 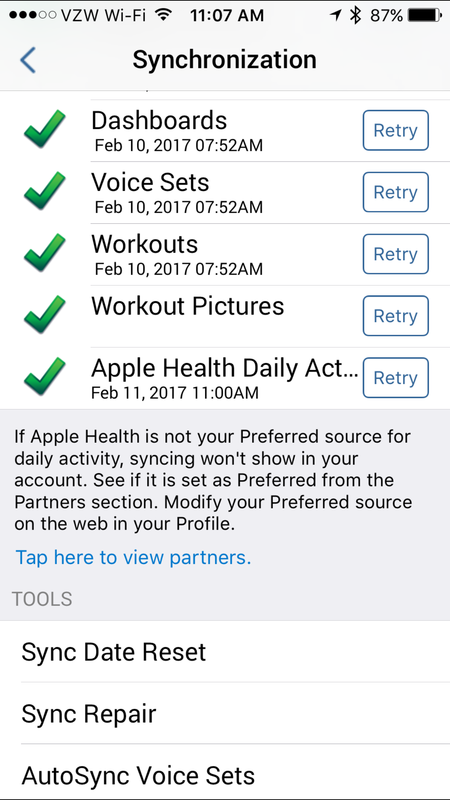 If you are not seeing any data from Apple Health to your Fitdigits app, check the >Partners page, make sure Apple Health is set as your preferred daily activity source. We only show and utilize data from one paired source, which can be modified in your Profile section online. Tap Enable again to re-enable linking. Make sure you choose ALL categories for both read and write when prompted. Tap Menu > Settings > Synchronization. If the last synchronization date is older, tap Retry. If you need to rebuild data, tap Sync Date Reset. The reset should replace the date under Apple Health with either the date you originally specified (if you initially chose “Starting Today”) or say “All Time”. Tap Retry next to Apple Health to initiate sync. If you are getting prompted in the app that there is another device currently linking with Apple Health on your account, but want to change devices, please disable then re-enable the Apple Health link (see Troubleshooting above). Note: pre-iPhone 5S devices not supported. Phones must have either Apple Health enabled on a device with an accelerometer to get daily activity detail. You can review or change any read and write settings from there at any time. What Data Shares with Apple Health? If you are paired with the Health app using the steps above, after you complete an activity, it will be shared with Apple’s Health app and stored there for review. Fitdigits will receive basic daily activity data such as steps and distance, depending on permissions granted and current levels of support. 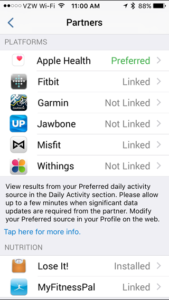 Fitdigits will not send data pulled from partners (such as steps from Fitbit) to Apple Health, as Apple expressly does not allow it. Apple has advised developers for the Apple Health Kit to not send their data to other activity tracking companies as well. 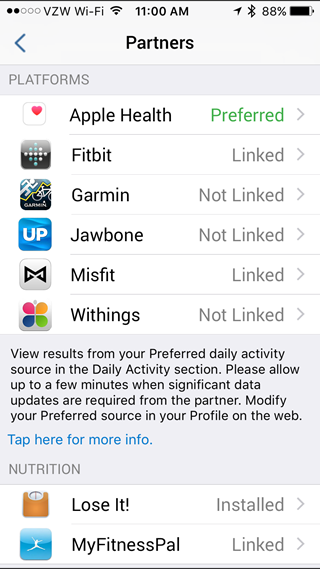 Also note Apple’s Health data does not sync to multiple devices. 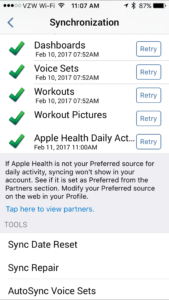 So if you have an iPad and iPod Touch, Apple Health will treat this as two separate accounts, leading to possibilities for missed workouts or duplicates (data doesn’t sync to Health across devices). Fitdigits is excited about the possibilities Apple Health offers, and we will continue to evolve our integration and functionality as Apple does the same.